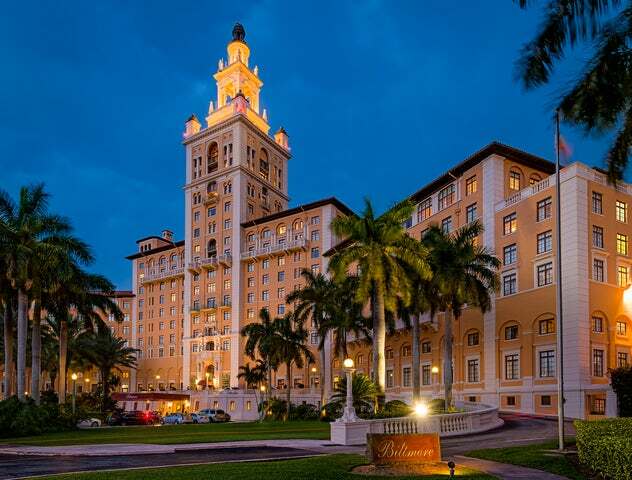 Located in Coral Gables, the Biltmore Resort brings luxury and recreation to both the budget and high-end customers. It comes complete with state-of-the-art conferencing equipment, luxurious spa, expansive, lush green golf course, and lavishly furnished rooms. Located in Coral Gables, the Biltmore Resort brings luxury and recreation to both the budget and high-end customers. It comes complete with state-of-the-art conferencing equipment, luxurious spa, expansive, lush green golf course, and lavishly furnished rooms. Couple this with the professionalism of the resort's staff and you have yourself the ideal holiday destination that you have been dreaming of. In total, the resort boasts 275 rooms, of which 130 are suites. Accommodation in the resort is divided into two broad categories - rooms and suites - each of which is named according to the views and amenities it offers. The rooms and suites include; superior room, deluxe room, junior suite, executive suite, 1 bedroom suite, golf suite, terrace suite, tower suite, executive suite, everglade suite and penthouse suite. Each of the rooms feature European feather bedding and Egyptian 340-thread count cotton duvets, plush bamboo orchid towels and frette robes, spacious sitting area, and are fitted with huge windows that allows views of the golf course, pool or elegant City of Coral Gables. One customer describes this hotel as 'stately, pristine and friendly with an inspiring tropical setup that lets you soak in the sun with the resulting tan eliciting jealousy from friends'. The resort offers its guest a lot of dining options. If you are into fine dining, you are well advised to haunt Fontana for the best Italian cuisine or Palme d'Or for French Cuisine. For casual dining, try Cascade or 19th Hole. If you love your brunch and tea, then your needs are best attended at Sunday Brunch or Afternoon Tea. If you would rather watch sports or drinks some beer/wine as you enjoy your meal, then the Cellar Club or Biltmore Bar are your best bets. Among the recreational activities you can engage in is Golf. The resort is home to a Ronald Ross Golf Course that divides its Tee times to the members, public and kids during kid's summer camp. If you do not know how to play golf, you can try your hand at Biltmore Golf Academy. Another popular leisure activity at Biltmore is visiting the spa. Here you will be offered services such as nail, hair, makeup, brow and waxing. Also within the spa you can enjoy massage, body treatment, facials, among others. If you are into losing a few pounds, the resort has a fully equipped fitness center. If you have been searching for a place to hold a meeting or a wedding venue, search no more. At Biltmore, you will not only have business meeting facilities, but also have the event catered for. The same goes for the weddings where professionals will decorate the venue, offer catering services and get you a professional photographer. The most important service offered at this resort that is different from others is offered at the Culinary Academy. Here, you get to mingle with some of Florida's best chefs and learn how to cook for special occasions, for large groups, for parties etc. Sounds fascinating? Contact us today and we will get you packing.